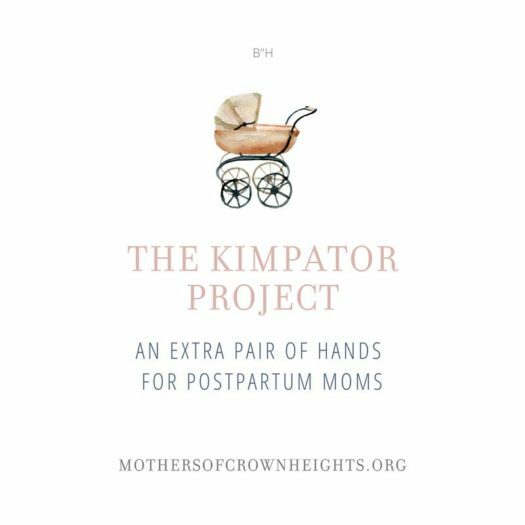 A new project in Crown Heights aims to restore thousands of years of tradition, where communities would get together and assist mothers who have just given birth – Kimpator moms. 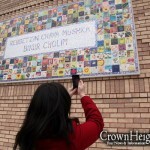 Mothers in Crown Heights – a site which was established in memory of Mrs. Miriam Friedman OBM after her passing in the summer of 2017 – is a website which centralizes many resources for expecting moms, and mother that are post-partum. The site contains lists of consultants, rabbis and therapists, along with lists playgroups and other resources. 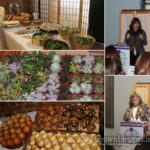 Recently they launched a new project, one which aims to restore thousands of years of tradition in Jewish communities, assistance to mothers who have just given birth. The project currently consists the “An Extra Pair of Hands” initiative, which will connect high school and seminary volunteers with mothers who recently gave birth, to help out for an hour a week, for up to six weeks post birth. 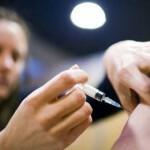 Other initiatives are currently in the works. that is a beautiful idea!!! husbands need to know to help and let their wives rest! and not expect them to go back to work straight away!!! fathers help ur wives!!!!! Thank you thank you!! This is really needed! beuatiful idea thank ou so much to whoever came up with this brainstorm!!! digest. Perhaps woman that have experience with these challenges can be a more of a help in this new and beautiful project. Mazal tov and may the community continue to help with these needs. For the first month, that’s when the kimpatur tends to already have more help from other sources — meals, gifts, visiting family members who help out (for those lucky enough to get this kind of help from family), etc. It’s after the “mazel tov” hubbub dies down, after about a month or two, that the kimpatur’s fatigue really kicks in, and the initial help is usually over. But for a typical kimpatur, perhaps the girls could help the mothers later on in the process. I for one remember the “Inner Circle” program, which sent me a high school girl for one hour, once a week, for several months. It doesn’t sound like a lot of help, but it really was VERY helpful to me! It didn’t start right away, but rather, when it was really valuable, a bit later on. Just having the cheerful attitude and presence of the girl sent to me was a beautiful thing, and she was helpful with anything I asked her to do. During the rest of the week, I’d sometimes realize, hey, I can have the “Inner Circle” girl help me with this when she comes! I heartily applaud all of this initiative l’iluy nishmas Mrs. Friedman! This is the perfect project with nicest memories for a giant of a Lady, Mrs Miriam Friedman OBM . Could not think of anything more befitting. What a perfect tribute. Long overdue in Crown Heights. Loved that Special Wonderful Lady She must be up there from Gan Eden smiling and only wishing well. Kol hakavod to Mushka (Friedman) Leiter for seeing the need and creatively doing something about it. Is Mushka Friedman the daughter of Avraham fried? Kimperturan was taken very seriously in our family! So pleased that it’s being revived and ‘with’ volunteers! It’s not easy to stay home for 4 weeks; but as you wrote…. it gives the mother time to acclimatise with her new baby and heal properly and there’s no pressure to go out to shop etc! no single organization can help everyone. How one hour a week with a young girl could be helpful in a meaningful way?The effort and new initiatives are always great and very timely for such children oriented community.It has reached an art level in other chassidic circles where most mothers go away to retreats for a week to recover.That requires a strong family support system, because sisters and other family members take care on the remaining children. it’s not an art. it’s a form of abandonment for the children, and affects long-term bonding. This is truly an amazing initiative. After one of my children were born, a friend of my wife arranged for meals from some of the organizations listed under the meals tab of this new website. Those meals turned out to be a tremendous help to the entire family. At that point I realized how stressful it was for both myself and my wife, when the other children were born, to have to deal with meals for the family. Regarding the practice that is common in other communities that new mothers go on retreats leaving the rest of the children under the care of others, I really hope that practice never makes it to Crown Heights. Having a new baby join the family is a HUGE event for the siblings that requires much love and at times reassurance. Try to imagine what it was like back in the day when a man can marry more than one wife, how would a women feel like when her husband comes home with “a beautiful new addition to the family”. It is not much different for a child. I personally spoke to מלמדים in those communities who confirmed that when new mothers leave, the remaining children at times go through extreme emotional turmoil. I believe very strongly that it also is a leading cause of sibling rivalry. Obviously there are times when it is of extreme necessity that the mother goes on vacation after birth, but the fact that it is the norm in some communities is troubling. Once again, thanks to all those involved in this beautiful initiative. What’s the source of the word “Kimpatorin”? Yiddish? Lahak? Polish? Yiddish, from German “kindbetterin,” a woman in childbed. What is it with today’s mothers that they need help? One of my grandmothers had 13 children and no help–she managed to do all the cooking, cleaning, sewing, laundry by hand (boiling it in a big pot out in the yard and used a washboard), maintained a vegetable garden, raised chickens for eggs/meat, milked the cow, canned food for the winter. According to my father she shopped once a year to lay in supplies for the winter. Plus she raised 4 grandchildren. She lived to be 86 years and did all that while having to put up with a nogoodnik for a husband. These “fragile” ladies should count their blessings. And she really had no help – not from her older children, not from the neighbors, not from anyone? One wonders, if that’s so, whether it might be because she was an offputting sort – rather like her granddaughter, actually. It’s not so much that they need to be helped but that we need to help them. Be a chossid and love chesed. Everyone will be better off as a result. The whole idea is that the mother who rests and recuperates after a baby is likely to cope better with her added responsibilities so it has apparently always been done, since Shifra and Puah in the Torah, that others help the mother rest and recover. Luckily in a large community such as Crown Heights, there are numerous ways to help so the entire responsibility of helping does not fall on the same handful of people as what might happen in a small community. having young girls/high school girls makes the women who receive this help feel like low class or in the need for pity. When people set up organizations to help they need to take into consideration the feelings of the person whom they are helping out. There must be a way to help postpartum that doesn’t make the mother feel not good about receiving the help. It never crossed my mind to feel “like low class or in the need for pity” when a volunteer teen girl helped me out once a week for several months, as part of the “Inner Circle” program, 16 years ago! All I felt was grateful. Oh, and maybe one other thing: uplifted! Seagate has been gone for several years. the issue with going to recover is timing. getting back and forth, duration of stay, and cost. not to mention what’s to be done for older children?